Each of us has a light body connecting the spiritual, emotional, and physical levels of our being. 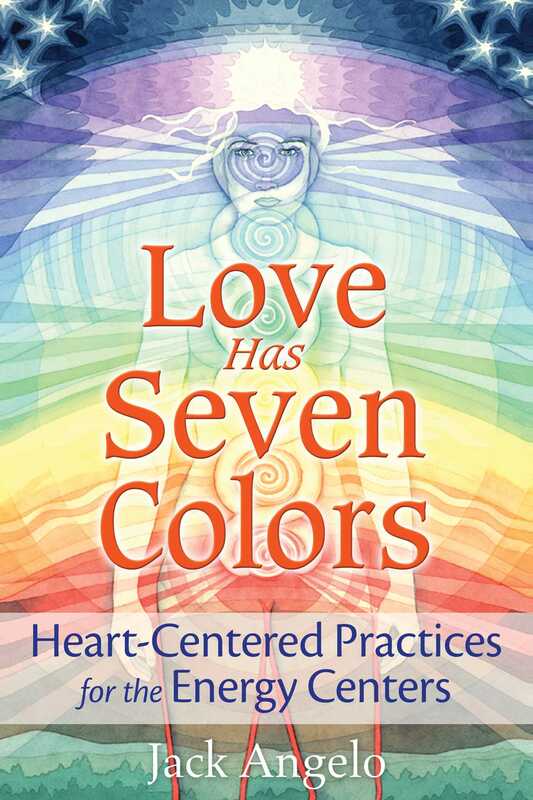 When we live in a heart-centered way and choose love as the basis for our actions rather than fear, each of the 7 energy centers of the light body opens to the wisdom of our souls and radiates with a different color, making us walking rainbows of unconditional love and soul guidance. Presenting the Inner Circle Teachings on heart-centeredness from the ancient mystery schools, Jack Angelo explains how unconditional love positively affects our subtle energy system and allows our 7 energy centers to form the full rainbow of connection between our hearts, minds, and souls. Describing the location and color of each energy center and the ways they can affect our physical, emotional, and mental well-being, he shows how the 7 energy centers control the flow of energy to and from the multiple levels of our being and process the energies generated by specific life issues. Providing 29 breathing, relaxation, meditation, and visualization exercises, the author explores how to open each energy center to the intelligence of the heart and retrain the mind to approach life with love instead of fear. He explains the role of the heart center in healing and how to balance the masculine intelligence of the mind with the feminine intelligence of the heart. Once the energies of these two polarities are balanced, we become truly heart-centered, radiating the 7 colors of love and following the wisdom of our soul to discover the spiritual reality of our sacred self. SINCE ANCIENT TIMES every culture has built its life around what it considers to be a sacred space: a center. It might be a building, a temple, a city, or simply a home; it might be a place outdoors, such as a mountain, a water source, a grove, or a clearing. Some cultures have even made their sacred center a person, such as a monarch, priestess, priest, or shaman. Each represents a point where contact can be made with Oneness/the Source. It is a point where Heaven and Earth converge, where human life meets the transcendent life of the spirit. The function of the sacred center is to provide a means of contact with the sacred so that human life does not become dominated by the demands and desires of individual ego-minds. We do not need history to tell us that having created every kind of sacred space around the world has not ensured that human beings are guided by unconditional love and the wisdom of the soul. We need to be heart-centered when we enter a space dedicated to the sacred, but what goes on in the space may not put us in touch with our heart. When this is the case, no religion or spiritual teaching will change the dominance of the ego-mind. Instead, religions and teachings become used for power and material gain. The missing link is the heart. This is why the wisdom teachings of heart-centeredness are always revolutionary at whatever time and wherever they appear. We are at a crucial point in human and planetary evolution: we have reached a tipping point where we are close to choosing the extinction of all life on our planet. The Inner Circle Teachings counsel that the way out of the situation can only be via a return to heart-centeredness and the guidance of the soul. Our planet was created for the soul to express the Source within physicality. The human being is key to this soul expression. We are here to be God, to be Oneness. How to do this has been presented to us for millennia, though the ego-mind has convinced us otherwise. However, the mind has run out of time to find ego-based solutions to our massive global problems. The call of the heart can still be heard, assuring us that we can trust the guidance of soul to reveal the way forward to peace and harmony. Perhaps we are now ready to hear the call and to listen. Entering the heart center to access this guidance is simple. It is the core activity of the Inner Circle Teachings. Find a comfortable position in which you can use your breathing to relax your body. Once relaxed, you are going to breathe into your heart center. Put your hand over this spot at the center of your chest to remind you of its position and to focus your attention. This is where you can gain access to soul guidance. Close your eyes (this signals your mind that you are present to yourself and detaching from external stimulation). Allow your mind to rest on your breath. Breathe slowly and gently into your heart center until you feel settled there. Acknowledge your soul--your soul has been waiting for this moment. Keep breathing until you sense your soul’s presence. This may feel like a tingling in the hands or a gentle pressure in part of your body. Enjoy the feeling of simply being in soul presence. Enjoy the calm and silence. Once you are aware of soul presence you can begin communication with your soul. You can check whether you are in touch with soul by asking a simple question and waiting for an answer. Once you become confident that you can communicate with your soul you will find that its guidance will usually surprise you. It will not use flowery or contrived language, nor will it announce that it is from another star or galaxy. Remember, your ego-mind will try to interrupt and give its own message. You will soon learn to recognize your mind by its language--it can only supply what is already in its database. When accessing the soul, there is nothing to learn at the level of ego-mind. Your soul is your spiritual reality. As you work with this book you will find that the separation between your ego-mind and your soul consciousness begins to close. Ultimately, there will be moments when you become aware of a single consciousness. This is what you will be working toward. Your soul can explain to you in simple language what your purpose in life is, where you came from, and where you will return to. If your communication ever seems complicated or long-winded, you can be sure that your ego-mind has interfered and is trying to take over and reverse your progress to alignment with your real identity and your link with Oneness/Source. Becoming heart-centered happens in four basic stages, rather like the levels of initiation in the ancient mystery schools. 1. We begin with our normal everyday level of consciousness, living with our inner perceptions unused or closed. 2. We catch glimpses or flashes of awareness as our consciousness opens through seeking answers. 3. From such small awakenings we begin to understand that the heart is indeed an organ of perception. We sense that the perception that we are all one is true. 4. Finally, we experience sacred unity, Oneness. We know that sacred unity is the actual reality of life. As we become aware that We Are All One, this awareness (called by the Greeks gnosis) is deepened. Awareness becomes knowing. We do not believe, we know, and faith appears as sister to this new wisdom. Our faith is based on our experience of knowing, not on systems of belief. Becoming heartcentered leads to an understanding and experiencing of the mysteries of life. Jack Angelo runs a healing and counseling practice in Gwent, South Wales. He is also a national trainer for the National Federation of Spiritual Healers and conducts his own workshops internationally. He is the author of Spiritual Healing: Energy Medicine for Today.